Item is a resignation letter from Sue Beaver from the Co-ordinator position and Ron Shuebrook from the Board of Directors and General Membership at Eye Level Gallery. Sue writes eight reasons for her resignation from the Co-ordinator position on January 15, 1976, which includes a lack of respect, unrealistic attitudes regarding money, lack of firm definitions and policies and practices which she regards as immoral and unethical. Ron writes in his letter from January 21, 1976 that there are many reasons for his resignation, which includes a lack of professionalism, a financial crisis of the gallery which was a result of unprofessional behaviour, and his move to Canning, Nova Scotia which left him feeling disconnected from the gallery. 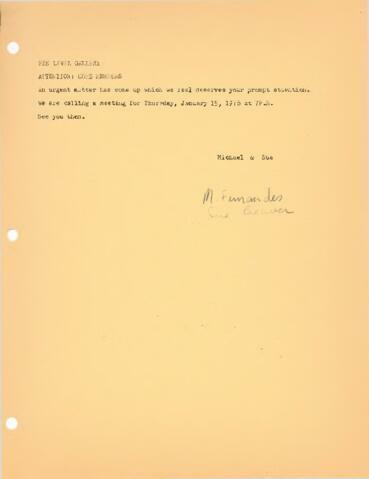 Also included in the item is a letter to members of the Eye Level Gallery stating an urgent matter has come up and a meeting needed to happen on January 15, 1976 at Eye Level by Michael Fernandes and Sue Beaver. A letter addressed to Sue Beaver from Brenda Wallace, the Visual Arts Officer for the Program of Assistance to Art Galleries and Museums states her acceptance of Beaver's resignation from the Eye Level Gallery.